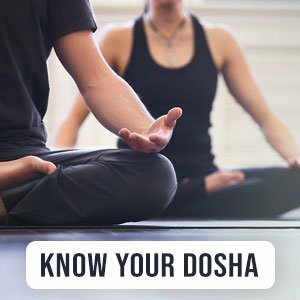 What are Doshas in Ayurveda? Tridosha, or the three doshas are bio-rhythms in our body. These are energies in the body that make up our constitution. Balancing these doshas is crucial in order to live a natural and healthy life. The dosahs are made up of the three elements, pitta (fire), kapha (water), and vata (air). The internal balance between these doshas is reflective of the overall well being of the person. The first step here is to know your dosha. Even though we are all made up of varying levels of each dosha type, there is one that is the most dominant in each of us. Now these can change over the years or seasons but to get a general idea of what your primary dosha might be take our quiz here. Make sure to take this quiz first to help you understand this article or come back to it again after taking it. Okay great! Now that you know what it is here is how you want to look into balancing your dosha. If your pitta dosha is imbalanced you may feel extremely hot, tired or dehydrated. The first step is to hydrate yourself. The next will involve going for a long cooling walk, preferably near a natural body of water like the ocean. The cool wind and the proximity to water will help re-balance this dosha. If you seem all over the place, with your mind constantly racing. It might suggest the excessive air is imbalancing your vata. At this moment you will need to seek out the stability of the earth. You need to be one with nature. Try a barefoot walk on the grass a few minutes of the day, every day. You will want to make sure that you get this walk done in and around sunshine as well. Absorbing the heat energy from the sun can help re-balance your vata. An excess of kapha can make you feel dull, tired or lethargic. In this case it is most important to change your immediate state. A run in a nature filled park or a mountain trail here is ideal while exposed to all of the elements. You will also want to move yourself, so make your effort a little strenuous. The key to re-harmonizing the kapha dosha is to inhale, absorb the life forces around you. Notice the nature, the wildlife, or the other active people around you and draw from their energy as they will empower you. Whatever activity you like it is important for you to practice this, at least, once a day. This basic guide shall help you balance your Ayurvedic body types once you know what your main dosha is. If you feel like your symptoms are persisting consult our doctors for more help.